Baghdad (AFP) – Iraq’s parliament Wednesday ordered a manual recount of the May 12 legislative elections and sacked the commission which oversaw the polls that resulted in a surprise victory for a populist Shiite cleric. Confusion has gripped Iraq since the vote won by Shiite cleric Moqtada Sadr’s electoral alliance with communists, even with negotiations to form a new government underway. Since last month’s victory of anti-establishment electoral lists for a four-year mandate, long-time political figures pushed out by Iraqi voters hoping for change have been calling for a recount. According to intelligence services, tests of electronic voting machines — used for the first time in Iraqi elections — produced varied results, appearing to give credence to the fraud claims. The election saw a record number of abstentions as Iraqis snubbed the corruption-tainted elite that has dominated the country since the 2003 US-led invasion that toppled Saddam Hussein. Many of Iraq’s longtime political figures — seemingly irremovable since the dictator’s fall — were pushed out of their seats by new faces. It is their voices — with parliament speaker Salim al-Juburi leading the charge — that have been the loudest in challenging the poll results. Less than half of Iraq’s 24-million electorate took part, dumping the old guard in favour of Sadr’s alliance followed by a list of former fighters of the Hashed al-Shaabi alliance that last year played a key role in the defeat of the Islamic State group. Once the first results came in, the United States and Iran, the two major political players in Iraq, both sent senior envoys to Baghdad to lobby on the make-up of the new government following the most open results since Iraq’s first multi-party elections in 2005. The presidency endorsed parliament’s decision on a recount, for which no timetable has been announced. He said such a scenario would “generate political tensions which could lead to other consequences”, especially in a country where several political formations are affiliated to fighting forces. It is in the multi-ethnic, oil-rich northern province of Kirkuk that the challenge to the election results has been the strongest — and the most potentially explosive. Kirkuk’s ethnically mixed population — majority Kurdish but with sizeable Arab and Turkmen minorities — pushed Iraqi authorities to impose a curfew on the night of the results. Featured Photo: AFP / AHMAD AL-RUBAYE. 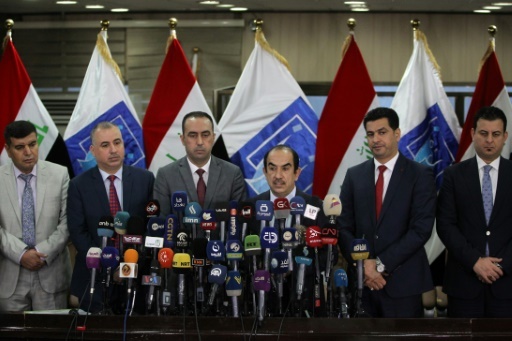 Riyadh al-Badran (C), head of Iraq’s Independent Higher Election Commission (IHEC), speaks at a Baghdad press conference, circled by colleagues in the nine-member IHEC on May 31, 2018.